Depart from your hotel this morning on our Full Day Cape Point tour as you commence your scheduled tour of the Cape Peninsula. 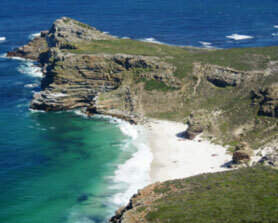 First, you will travel via the 12 Apostles and picturesque Hout Bay to Chapman’s Peak. This is one of the region’s most dramatic mountain drives and offers amazing panoramic views over the city and environs. Descend the mountain pass and continue on to the coastline. This strip of the peninsula’s shoreline, commonly known as the Atlantic Seaboard, stretches some 34 miles from the waters of Table Bay along the western coast to the nature reserve at Cape Point. The exceptional beaches and rugged mountains along this coastline not only make this a popular drive, but also provide outstanding views across the Atlantic Ocean, with some of the most spectacular sunsets in the world. 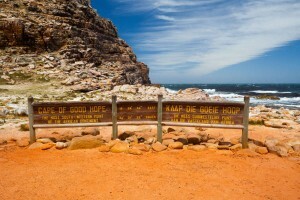 The Cape of Good Hope Nature Reserve comes to an end at majestic Cape Point. Situated at the junction of two of earth’s most contrasting water masses – the cold Benguela current on the West Coast and the warm Agulhas current on the East Coast, the Cape of Good Hope is popularly perceived as the meeting point of the Atlantic and the Indian Oceans. Guests will take the funicular to the vantage point from where they will be able to witness the “meeting of the two oceans”. Our Full Day Cape Point tour include a visit to Boulders Beach, which is home to a colony of endangered jackass penguins in Simonstown. Technically, these are African penguins, but early settlers thought that their braying sound was more like a four-footed pack animal than a two-footed bird! You will also have the (optional – cost not included/at own expense) opportunity to visit the colony of seals on the aptly named Seal Island, before returning to your hotel in the late afternoon.